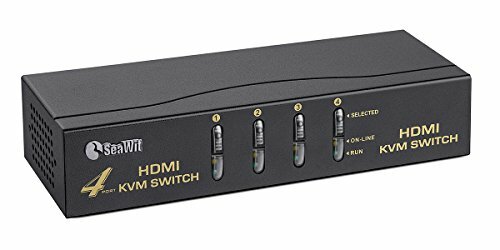 SeaWit 4 Port HDMI KVM Switch is designed to control 1 to 4 computers, servers, DVR/NVR, laptops, hard disk players and other HDMI interface devices with only 1 independent set of USB keyboard, mouse and monitor. It allows user to easily switch the connected devices via advanced switch modes. The unique KVM technology can significantly save the desktop space, equipment spending and the manpower for managing multiple computers/devices as well as can maintain the best HDMI display resolution. Switching mode without any software, compatible with Windows,Linux,Unix,Dos and Mac. 1.Button on the front of the panel. Switching via the software, the software is only compatible with Windows 95/98/2000/2003/NT/XP/7/8/8.1/Vista but not other systems. 1.Using mouse to switch to any connected device you want. 2.Setting automatic cycle scan,the interval of auto switch can be set (10 to 60 seconds). 3.Double-clicking the Scroll Lock (or Num Lock) on keyboard to switch to the next device. KVM SWITCH: 1 USB or PS/2 console controls 4 HDMI - interface devices. Supports auto scan and 3 switch modes: Button switch/ keyboard switch / Mouse Switch.It also supports Hot-Plug that you can plug and unplug the device without power off. HD VIDEO QUALITY: Completely compatible with HDMI 1.4A, HDCP and wide screen. Supports HDMI digital monitor, 3D ,480i, 480p, 720i, 720p, 1080i, 1080p (HDTV) ,1920x1200(DVI). HIGH and STABLE PERFORMANCE: High-quality chipset, gold-plated interface, environmental metal shell and multiple heat dissipation design, which all ensure the stability of the item running and a good user experience. DYNAMIC SYNC DISPLAY TECHNOLOGY: With the EDID (Extended Display Identification Data) technology which controls display by memory function, the switch can maintain optimal display resolution all the time. OPERATION SYSTEM COMPATIBILITY: Fully support Windows 95/98/2000/2003/NT/XP/7/8/8.1/Vista (Achievable all switching modes )and Partially support Windows 10 /Linux/Unix/Dos/Mac(Only panel button to switch ). If you have any questions about this product by Jiazy, contact us by completing and submitting the form below. If you are looking for a specif part number, please include it with your message.